I'm currently using 3Blue1Brown's tutorial series on neural networks and lack extensive calculus knowledge/experience. The issue is, during backpropagation, the gradients keep cancelling each other out because I take an average for opposing training examples. That is, if I have two training labels being [1, 0], [0, 1], the gradients that adjust for the first label get reversed by the second label because an average for the gradients is taken. The network simply keeps outputting the average of these two and causes the network to always output [0.5, 0.5], regardless of the input. To prevent this, I figured a softmax function would be required for the last layer instead of a sigmoid, which I used for all the layers. However, I have no idea how to implement this. The math is difficult to understand and the notation is complicated for me. The equations I provided above show the term: σ'(z), which is the derivative of the sigmoid function. 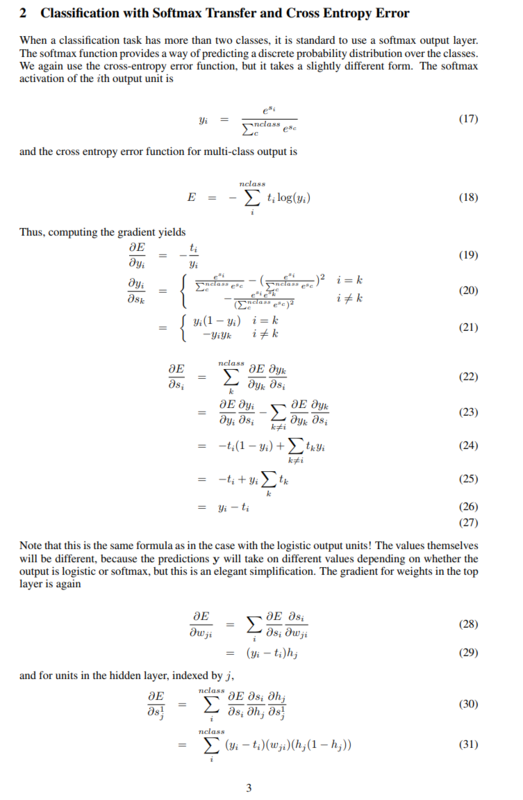 If I'm using softmax, how am I supposed to substitute sigmoid with it? If I'm not mistaken, the softmax function doesn't just take one number analogous to the sigmoid, and uses all the outputs and labels. The equation for the neuron in every layer besides the output is: σ(w1x1 + w2x2 + ... + wnxn + b). How am I supposed to make an analogous equation with softmax for the output layer? After using (1) for forward propagation, how am I supposed to replace the σ'(z) term in the equations above with something analogous to softmax to calculate the partial derivative of the cost with respect to the weights, biases, and hidden layers? One of the best ways to learn is use reference of others. There is also a great blog post by Eli Bendersky - The Softmax Function and Its Derivative. Not the answer you're looking for? 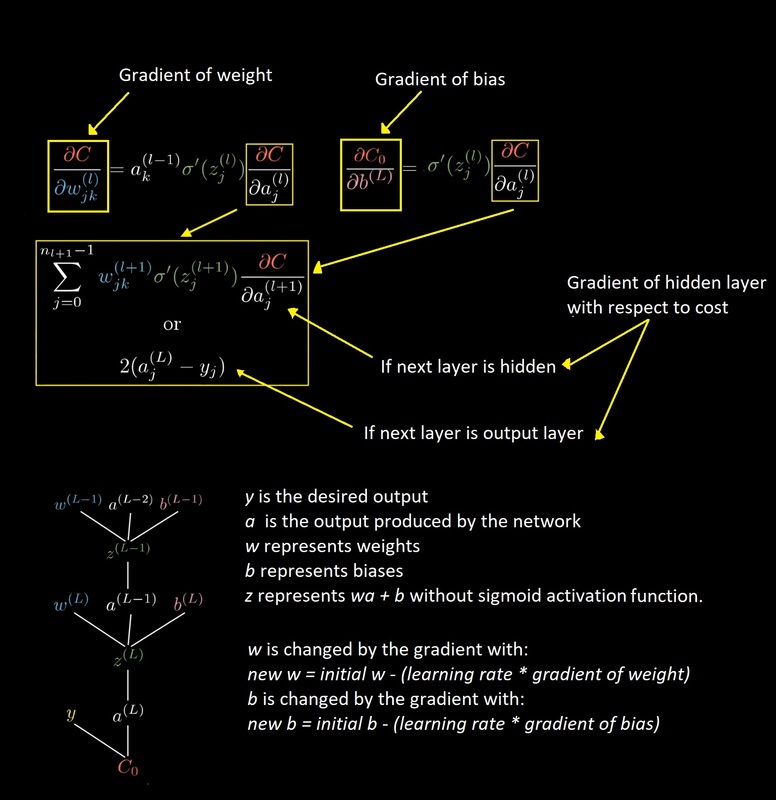 Browse other questions tagged neural-networks backpropagation gradient-descent or ask your own question. How does an activation function's derivative measure error rate in a neural network? neutral network - How to solve this? How is gradient calculated for middle layer weights? Predicting sine using LSTM: Small output range and delayed output?